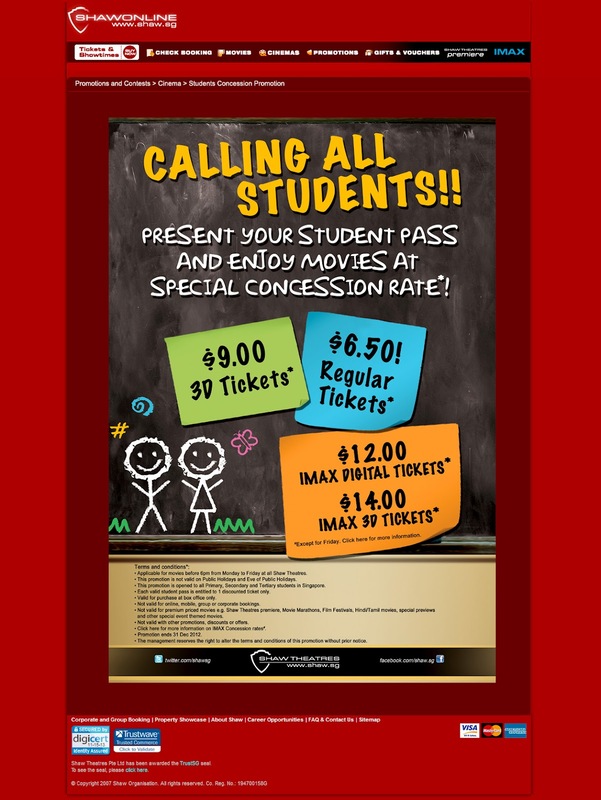 Discounted movies tickets for students in Singapore! Applicable for movies before 6pm from Monday to Friday at all Shaw Theatres. This promotion is not valid on Public Holidays and Eve of Public Holidays. This promotion is open to all Primary , Secondary, Tertiary students in Singapore. Each valid student [pass is entitled to 1 discounted ticket only. Valid for purchase at box office only. Not valid for online, mobile, group or corporate bookings. Not valid for premium priced movies e.g. Shaw Theatres premiere, Movie Marathons, Film Festivals, Hindi/Tamil movies, special previews. The Shaw management reserves the right to alter the terms and conditions of this promotion without prior notice.